Waleta Mae Buck, 93, passed away Sunday, June 10, 2018 in Clay Center. She was born September 29, 1924 on a farm near Broughton to Walter and Emma (Mall) Bushell. She was very close to grandmother Eva Mall and grandfather Jake Mall and lived with them in her early years. She graduated from Clay Center Community High School in 1943. She married Bernard Brown and later Robert Buck, Sr. Waleta and Robert, were married 50 years before his death in 1997. 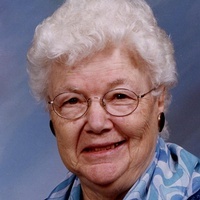 She was a member and president of the South Hayes Extension Homemakers Unit. In 1984 she was nominated as Homemaker of the Year by Lincoln Creek E.H.U. She also assisted with leading classes for members of the Hayes Booster’s 4-H Club. She was preceded in death by her parents and husband, Robert Buck, Sr.; daughter Roberta Mae Buck; sons, Warren, Robert, Jr., Eddie Dean and Terry Buck; and grandson, Chad Buck. She is survived by her daughter, Carol (Brown) and husband Donald Sutter; son, Ronald and wife Tammy Buck; daughter, Margaret Buck; son, Clinton Buck; 14 grandchildren and many great grandchildren. Waleta was a homemaker known for her quilts, crocheted blankets and many craft projects as well as a large salt and pepper shaker collection. Funeral Services will be held on Thursday, June 14, 2018 at 10 AM at Neill-Schwensen-Rook Funeral Home. Internment will take place at the Broughton Cemetery.